Hair Woes It is nice to know that even in these times of economic… - Laughs! Thrills! Pathos! It is nice to know that even in these times of economic uncertainty and social upheaval some things remain the same, and my Hairdresser Curse is as powerful as it has ever been. I am not sure why whenever I say "Shoulderlength hair plase" it is heard as "Chop! Chop more! Go wild! Bonus points if you can make Nina's head look like a mushroom!" And today's haircut was no exception. I've never yet had the guts to transform my sinking inner feeling into a torrent of public complaint about the blatant disregarding of my hair wishes and instructions, so simply end up handing over my credit card and vowing to never set foot in that place again. This also explains why I get a haircut roughly once every two years. I am trying to be philosophical about this newest mauling of my locks, because it is hair and it will grow but grrrrrrrrrrrr. A few days ago I managed to present myself at an interview in the deep South East of London, on time, with all the relevant paperwork and wearing a lovely dress free from food stains and cat hair. However, these actions obviously maxed out my Responsible Behaviour allowance because I managed to lose both my Oyster card and fall down and smash my knee. I have a new Oyster card and my old knee and no self-respect. The children have spent the last two weeks being poorly, crying and clinging to me like consumptive barnacles but considering that Matei's efforts this morning included attempting to give haircuts to the cat and the Christmas tree*, his return to health appears imminent. The Christmas tree has been much beleagured this year, as seen from its "Passangers scrambling up the sinking Titanic" style of ornamentation. Helena keeps patrolling and plucking off anything within her reach. Fish is cooking, guinea fowl is waiting in the fridge, so Season's Greetings friends and may the festivities commence. 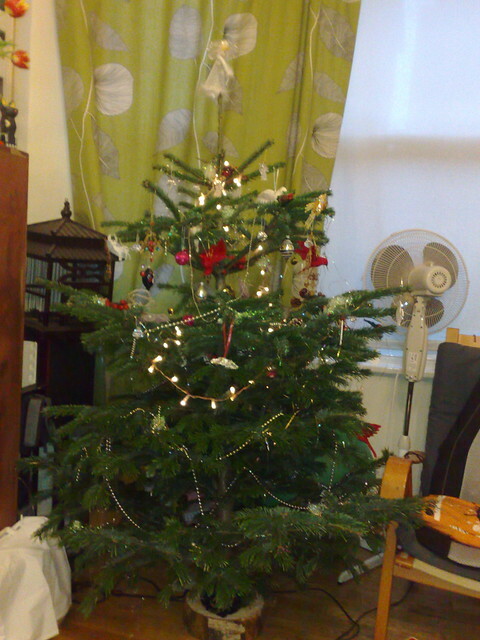 *The cat is quite well defended, although Christmas tree not so much.